Well I am still buzzing! Apart from the guests of the after show party, we were in the last handful of fans to leave the building. Our delay was due to waiting for the crowds to clear from the merchandise stall and having met a very interesting chap who had a story or two to tell of his links with Kate. His name is Rudi and he and his wife are from Koln in Germany. He showed us his photos that he took of Kate in 1979 during a couple of gigs she did there, also a handwritten letter from her. It’s good to sit quietly and try and absorb what we were just part of. Hubby is reading the first of the reviews already posted online. I’d rather not spoil what was an evening of surprises, so I’ll concentrate on the feelings and the look rather than the detail. We arrived early and had a good hour sat in our seats, watching people arrive and looking at a stage full of instruments. It was clear that the show would at least start without all the expected puppetry and theatre. Two key boards, a piano, lots of guitars and a huge percussion section made sure of that. It’s a while since I’ve seen any music live but I do remember plenty of bands being late in the 1980s. Bang on 19.45 pm the magic began. At first there were two striking things, the intimacy of it and the barefooted Kate herself. The past few weeks the only images of her that we’d seen, were TV documentaries and compilations of her early work, a young gymnastic and very petit dancer with big hair. Her hair is still big, and she is still petit in height, but Kate has matured and her voice is now stronger and her body is now matched that power. Her voice began a little carefully but as the night progressed she grew and her voice was astounding. She delighted us all with half a dozen of her greatest but more recent songs and introduced her fantastic singers, the band, her lighting manager and most importantly ‘Bertie’. 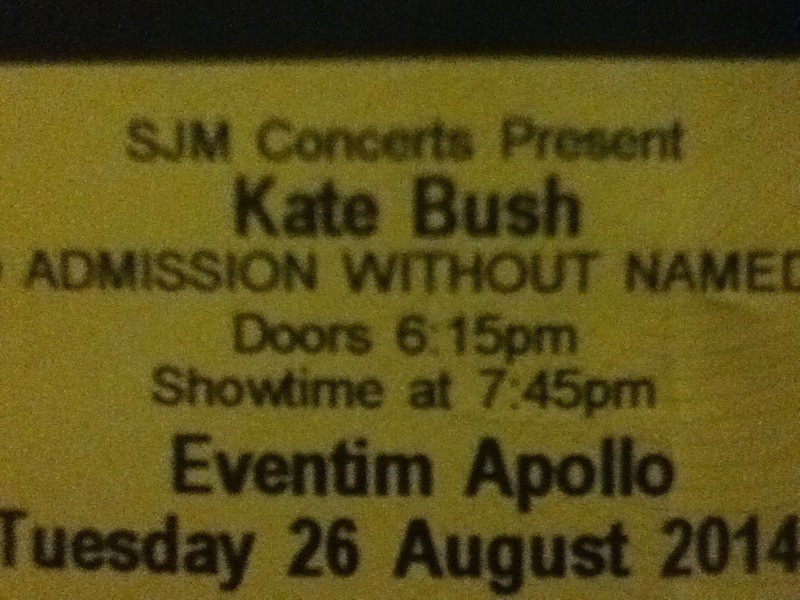 My hubby is a recent fan of Bush music, actually just since I managed to get us tickets. Every journey in my car has had a selection of her CDs playing in it and the past ten days he’d even been choosing to listen to ‘the directors cut’ in his own car. The first half of tonight’s show astounded even him. We were all drawn into her world, her imagination and the songs I have listened too so many times in my bath, have a renewed sense of meaning. We were all taken on the journey with her. The second half was more for the dedicated Bush fans, but so sensual and as I had initially expected, the music and dance was so intertwined with an atmosphere of meditation. Every note, step and brush stroke was carefully thought out accentuated by the lighting. Truly magical. It was wonderful that the audience had all stuck by her no ‘mobile devices’ rule. There were no distracting flashes or glows of cameras. We were all entranced together, all loving Kate as she poured her love over us. It was terribly English however with all but a handful remaining seated throughout. There were a couple of over enthusiastic dancers who were asked to refrain by the security, to applause by those seated around. We weren’t at your traditional ‘gig’, we were watching one of the greatest story tellers of our time, all eyes on her and the stage. We clapped together ( Radio Gaga style) were several standing ovations, and the longest at the end followed by two encores then groans and boos when the stage hands came on to dismantle the set. Only then did the audience think about leaving. None of this takes away Kate Bush’s originality. What we were lucky enough to see tonight was totally unique and original and boy do we feel blessed to have been there and shared it with so many. It certainly happened in Hammersmith tonight. Next Was it ‘Wirth’ it? what a brilliantly written review.